Rajiv Kohli and Kash Mittal have brought together the work of experts from different industry sectors and backgrounds to provide a state-of-the-art survey and best practice guidance for scientists and engineers engaged in surface cleaning or handling the consequences of surface contamination. The expert contributions in this book provide a valuable source of information on the current status and recent developments in surface contamination and cleaning. The book will be of value to industry, government and academic personnel involved in research and development, manufacturing, process and quality control, and procurement specifications across sectors including microelectronics, aerospace, optics, xerography and joining (adhesive bonding). Rajiv Kohli is a leading expert with The Aerospace Corporation in contaminant particle behavior, surface cleaning, and contamination control. At the NASA Johnson Space Center in Houston, Texas, he provides technical support for contamination control related to ground-based and manned spaceflight hardware for the Space Shuttle, the International Space Station, and the new Constellation Program that is designed to meet the United States Vision for Space Exploration. Kashmiri Lal "Kash" Mittal was associated with IBM from 1972 to 1994. Currently, he is teaching and consulting in the areas of surface contamination and cleaning, and in adhesion science and technology. He is the Editor-in-Chief of the Journal of Adhesion Science and Technology and is the editor of 98 published books, many of them dealing with surface contamination and cleaning. 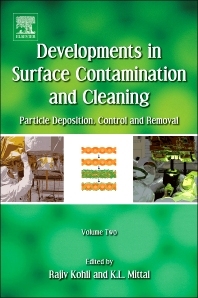 Developments in Surface Contamination and Cleaning, Volume 1: Fundamentals and Applied Aspects (edited by Rajiv Kohli & K.L. Mittal). ISBN: 9780815515555.